Osiris was discovered on September 24, 1960 by Cornelis Johannes van Houten and Ingrid van Houten-Groeneveld at Palomar Observatory near Pauma Valley, California. At this time, Pluto was conjunct the North Node of the Moon in the sign of Virgo. The Virgo Pluto and North Node was also trine Saturn in Capricorn and sextile Neptune in Scorpio. Uranus was in Leo in a balsamic phase with Pluto in Virgo- within five years they would be conjunct. I took part in a book club discussion group with Dr. Thom Cavalli, the author of Embodying Osiris: The Secrets of Alchemical Transformation, in May 2012 on the Depth Psychology Alliance network. In our discussions Dr. Cavalli made the point that creating an archetype for Osiris is extremely difficult because of the vast array of dissonant qualities he embodies. Nonetheless, I found that his teaching regarding Osiris resonated with astrological archetypes, and even though Osiris embodies a huge diversity of archetypal meaning, it is a fact astrological archetypes such as Pisces are incredibly vast and beyond our abilities to confine their meaning to singular categorizations. I do want to make the point, however, that I am merely exploring the idea of an Osiris archetype at an early stage of development here, and I am hoping to receive comments from anyone reading this about the possible meaning of Osiris in their own life. The “birth” signature for the discovery of the Osiris asteroid in 1960 brings up some of the major themes I feel that the Osiris archetype embodies: Virgo, Pisces (by polarity), Scorpio, Taurus (by polarity), Capricorn, Cancer (by polarity), Leo, Aquarius, Uranus, Saturn, Neptune, Pluto, and the modern astrological interpretation of the North Node of the Moon being about an evolutionary development of Soul purpose. I have also been interested in exploring the archetype of Isis associated with the Isis asteroid, and will do so to a greater extent in a subsequent article. For now, I want to draw attention to the cyclic conjunctions of the Isis and Osiris asteroids, which happened again last week. In connection with the myth of Isis and Osiris, I feel like this conjunction cycle could have the effect of “re-animating” the Osiris archetype in collective consciousness, and I am curious if anyone reading this can sense any correlations to this idea in their life. On March 2, 2013 the asteroids Isis and Osiris were conjunct at 11 degrees of Aquarius. From what I can tell, both the Osiris and Isis asteroids have orbits of around four years and have a cycle of conjunction about every two years (August 2007 at 21 degrees Leo; April 2009 at 13 degrees Aquarius; June 2011 at 12 degrees Leo; March 2013 at 11 degrees Aquarius; and the next one will be April 29, 2015 at 6 degrees Leo). The fact that these recent conjunction points have all been along the Aquarius-Leo axis also goes along with the importance of both archetypes in relation to the Osiris myth. The Aquarius archetype and it’s relationship to consensus culture, the Saturn and Capricorn archetypes, in particular feels resonate to me with Osiris, so it is fitting that this recent conjunction happened in the strong 10-11 degree range of Aquarius. Aquarius 11 : During a silent hour, a man receives a new inspiration which may change his life. Keynote: The need to rely upon inner inspiration and guidance at the start of new developments. What is implied here is the essential value of keeping open to the descent of spiritual or Soul forces, especially when a new period of individual activity is about to begin. The individual should not depend mainly on outer circumstances and on traditional- and in a sense external, because collectively formulated- incentives. There is a creative power within, a power that can be tapped, or rather that should be allowed to flow into the brain-consciousness or the hands which write or fashion materials into original forms . . . It refers to the OVERSHADOWING of the individual consciousness by an inner, yet transcendant, Power. This symbolism from the point of the Isis-Osiris conjunction, in square to Saturn retrograde in Scorpio, reflects the deep cathartic potential of these intense times as we get closer to the next Uranus-Pluto square in May. Saturn in Scorpio at this time, in square to Osiris-Isis reflects intense tests and challenges from our environment requiring us to go deep within ourselves to confront the core issues interfering with our ability to merge our true sense of Self into the greater world. In my opinion, this symbolism also integrates some of the meaning of the Osiris archetype: regeneration from within, transformation of collective conditioning through a process of artistic manifestation, and an inner “gold” we have inside of ourselves that we can access to transcend the limitations of our conditioning. 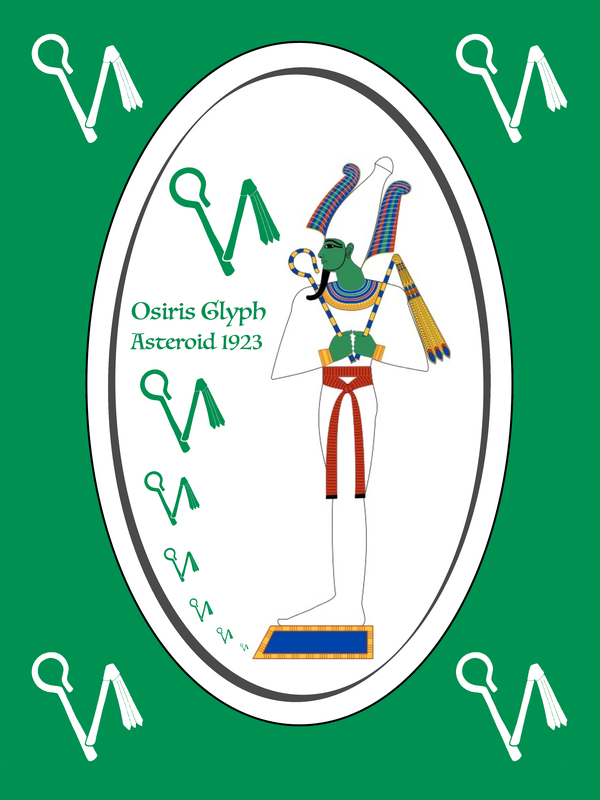 Look to the House and Sign position of the Osiris asteroid (#1923) in your chart to find a place where you have been wounded by consensus societal conditioning, and where you have a need for self-exploration, self-transformation, and regeneration. Osiris involves many diverse qualities, but especially involves archetypal themes of Taurus, ruled by Venus, and Scorpio, ruled by Mars in traditional astrology and Pluto in modern astrology. Themes of individuating, themes of becoming, themes of regeneration. According to Cavalli, “Osiris is best understood as a complex consisting of a cosmic deity, an earthly deity, and an underwold deity that still exists within the realm of psyche.” Osiris is a “personal archetypal figure” who intermediates between the divine Ra, “the archetype of wholeness that includes everything conscious and unconscious,” and Horus, “the defender of the Earth” (Embodying Osiris, p. 40). Some of the possible meanings of an Osiris archetype involve individuation, Self transformation, and alchemy. Dr. Thom Cavalli’s book Embodying Osiris: The Secrets of Alchemical Transformation connects the etymological meaning of “alchemy” with the mythic figure Osiris. While “al” means “the,” and “chemy” means “black,” it does not mean that alchemy is “black magic” or some other dark or evil form of witchcraft- this perspective comes from uninformed bias. Dr. Cavalli makes the point that “the black” has a clear link to the black, dark, moist, and regenerative soil of the Nile River in Egypt, a historically significant area of agricultural development that led to one of the world’s first dominant and extensive civilizations in the Age of Taurus (roughly 4,420 – 2,260 B.C.). Osiris was a major deity of this civilization, the fertile River God of the Nile, and he has his roots as a God of Agriculture and Fertility in a similar manner to the Great Goddesses of this time period. Thus, there is not only the link to Taurus through the historical astrological age (a time of Bull worship around the region), there is also connection to the Goddess energy of Venus fertility. In addition, after undergoing symbolic and literal death in the myth, Osiris transforms into a Plutonic deity who rules the underworld and heals the souls of the dead, linking him to the Scorpio archetype and Pluto and Mars (Nergal, the Babylonian Mars in astrology and myth, was an underworld ruler). Finally, the 8th house (Scorpio) mastery of unconscious forces Osiris achieves can be utilized ultimately as a 2nd House (Taurus) resource: “Osiris, then, is the archetypal energy activating the unconscious so that it is not only a repository of memory, but also an incredible resource in everyday life” (p.41). [Osiris is] the personification of the collective unconscious, all that existed in the collective unconscious psyche, but which was not included in the conscious religious forms of that time. In our book club, Dr. Cavalli also commented that another method in this alchemical process could be to exhaust the instincts, which goes very well with the Evolutionary Astrology process described by Jeff Green in which we work toward evolutionary development through exhausting our deep soul desires, the resonate soul desires related to our current lifetime being symbolized by the house, sign, and aspects of Pluto in the birth chart. The “gold” we can reach through this process is like a potential we could reach that would be so whole and balanced it would need no more transformation. Cavalli described this “Divine Self” as “the conscious union of ego and Self, instincts and archetypes, feminity and masculinity, psyche and soma- having an active relationship with the unconscious; mastering the technique of active imagination; integrating shadow; recognizing projections; and, finally, achieving ‘object love’ with individuals, the collective, nature, and God” (p. 49) . In the Osiris myth, the archetype of lead enters the story through the manipulative and power hungry Seth character, who tricks Osiris into becoming sealed inside a coffin, and sends him down the Nile. 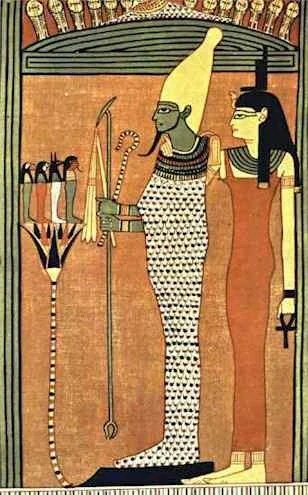 Seth was angry with Osiris because of his infidelity with Nephthys, who was the wife of Seth, a mating that produced the offspring Anubis. As a result of his rage, jealousy, and desire for power, Seth not only murders Osiris but cuts his body up into various fragmented pieces. After a long journey, that in some scenes has thematic parallels to the myth of Demeter/Ceres searching for her daughter Persephone, Isis finds Osiris, puts his body back together, makes love to him, and reanimates him long enough to produce their offspring Horus. 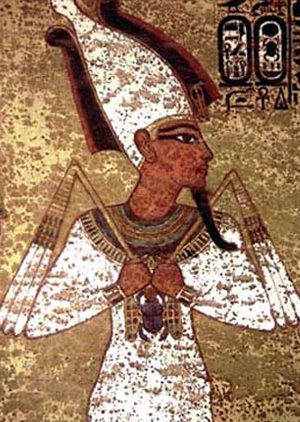 Ultimately, Osiris descends to the underworld and resurrects himself as the ruler and healer of souls of the dead. In the myth, Seth represents an archetype that seeks power within societal hierarchies; he is Machiavellian and by the mere fact of having this political nature necessitates the existence of a “civilized” power structure to climb and conquer. This symbolism is why I feel the Osiris archetype also involves the Aquarius-Leo archetypal need of liberating from dominant societal conditioning in order to find and self-actualize one’s true heroic journey, the special purpose one has incarnated into this lifetime to achieve. Fascinating to me is that there is a mirror of the Osiris myth in the story of Moses in the Bible, who liberated the Jewish people from their Egyptian oppression in the Age of Aries. Moses was also sent down the Nile River, but in this version he is a baby who had been born into a Jewish slave family, only to be rescued by a member of the House of the Pharaoh and taken into the inner circle of the Pharaoh. Moses grows up surrounded by Osiris and Isis and sees firsthand how the role of the Pharaoh had become distorted through oppressive use of power. Moses eventually becomes the liberator, and is one of many heroes in humanity’s history whose life has echoes of Osiris running through it. Part of the trigger that led to this mythic journey of Osiris was his mating with the wife of his brother, Nephtys. In some versions Osiris seduces her, in other versions Nephthys tricks Osiris by disguising herself as his wife Isis, but in all the versions there is the cultural taboo of infidelity explored. This part of the myth connects with the archetypal axis of development from Taurus to Scorpio, and how sometimes it takes us exploring a cultural taboo in order to find our true value system. In Embodying Osiris Dr. Cavalli wrote that “the world soul, Anima Mundi, and the transcendent Self envision this light that is trapped within our decaying body, a self-serving ego, and, more generally, the unconscious. From time immemorial there have been taboos to keep one from discovering this divine inner light, for unless we are ready to receive it we will either misuse this sacred light or destroy ourselves” (p. 101). Scorpio has multiple levels of symbols, the scorpion being the lower, the phoenix and the eagle a Scorpio who has moved on to a higher level of consciousness. One key aspect of Scorpio as part of an individuation process ultimately leading to higher levels of consciousness, can at times be exploring cultural taboos and ultimately finding more of one’s true self by the end of the process. In healing work, confronting and becoming aware of the shadow side can often involve experiencing taboos of a culture or testing taboos in different ways- often leading to a lot of shame and guilt and depression, but in the end an awareness of the shadow that can propel one through a spiral process into higher states of awareness and consciousness. 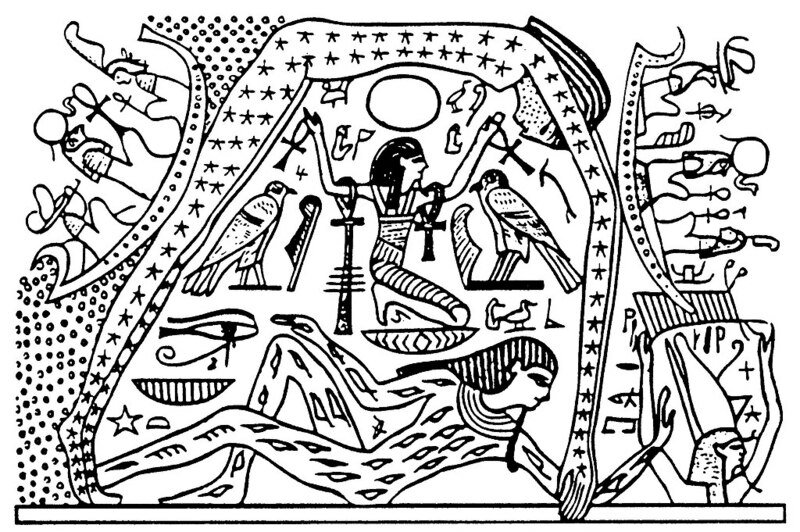 In this way, the location of Osiris in your chart could indicate a place where you go into an underworld journey of shame or depression as a result of testing certain cultural taboos that society conditions us to believe makes us a “bad” person, but that in the end through confronting and facing these deep issues we can ultimately regenerate a truer version of ourselves. This is because the “true gold” of our soul journey has been inside us all along. Isis epitomizes love and loyalty; Seth, antagonism, opposition, and limits; . . . But when it comes to Osiris we encounter a psychological complex far more difficult to comprehend than that of most Egyptian deities. His relationship to life and death cannot be easily assigned certain fixed values. Rather than a state of being, his nature has more to do with the process of becoming (Cavalli, p. 63). Furthermore, another interesting connection with Saturn, Capricorn, and collective responsibility is that this individuating process is not meant to serve our selfish ego needs, but is an act of opening ourselves to what the universe or Spirit wants from us. Cavalli wrote that if we wish to embody the Osiris archetype, “we must take into account his ‘individuation’ as he matures into a cosmic archetype. What he does is not for self-gain but for the benefit of all. Ultimately, the spirit of the dead arrives in the duat, the fitting place for him to reign as god of the dead and master of unconscious forces” (p.1 75). In this way the Osiris archetype can reflect the Aquarian liberation from Capricorn conditioning to ultimately make a Piscean surrender to having Capricorn responsibility for an inner power that is for the good of all, an inner power that can have a Scorpio knowledge of how to merge and use resources for the greater collective interest. This is not easy work- the myth of Osiris symbolizes how we can become dismembered and put through death experiences in society, how our psyche can become fragmented through the experience of trauma and harsh societal conditioning. At times it seems like it would take an act of divine intervention from a Goddess like Isis to reanimate our psyche and make us whole again. However, as the alchemical symbolism suggest, we have this spark of golden being inside of ourselves, awaiting our self-activation and actualization. Osiris is a model of submission. He allows all the terrors that befall him to occur, just as the prima materia endures the tortures of the laboratory. such deliberate sacrifice is meant to serve as a model for personal individuation. It justifies all the pain we daily suffer in order to transcend this world and leave it wiser and more enlightened. Submission and trust in this process allow love to enter the vessel. We are then embraced by the Mother and taken into her arms. Her only aim is that we bring something new and unique into the world. The dead ask no less of us. In the Red Book Carl Jung reveals that the dead want us to take up their unresolved burdens. We are left to reassemble our lives by submitting to our ancestral destiny. 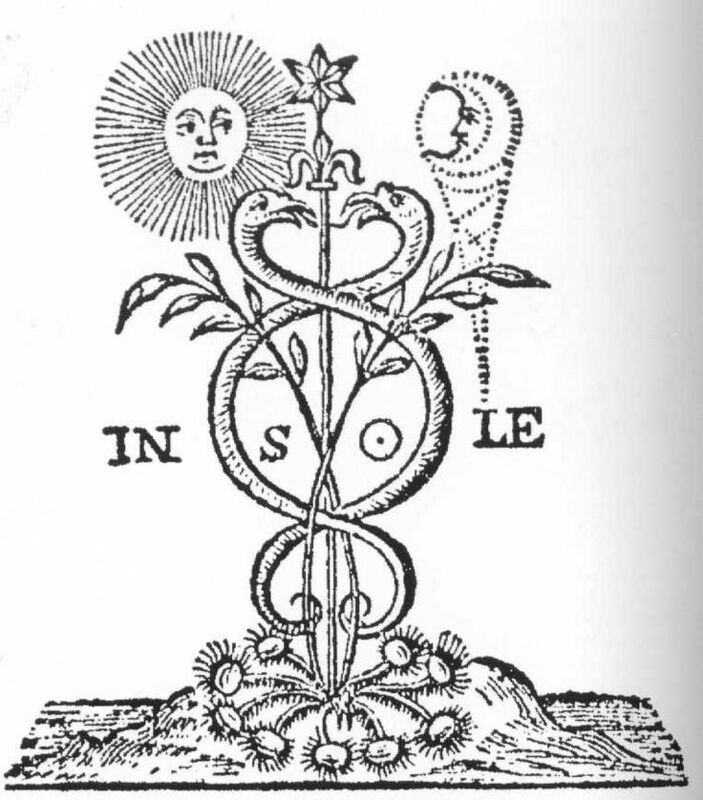 In this way, individuation is shaped by the Mother (Anima Mundi) and the souls of the departed who want us to bring their purpose to its rightful conclusion. And so, in similar fashion, we die, but our relationships live on for a time equal to the contribution we’ve made while living. Just as Osiris dies but is not nonexistant, we too live beyond physical death. Having an active relationship with the unconscious, we are not surprised by death nor, as Jung suggests, are we ever alone! We have prepared ourselves for this transition- another point of constriction that we have faced before in so many different ways. With Osiris in the underworld, the unconscious becomes a safe place for death during our lifetime. Here it is a powerful resource and teacher. Death serves to remind us that physical life is limited and that we must enjoy every finite moment before entering a timeless place. This realization casts a special beauty over everything that occurs in life. Darkness enhances life’s treasures; death tinges the light with softness. The melancholy of an Indian flute, the sound of a foghorn in the mist, tears at the cinema- these are subtle pleasures that emanate from the deepest places in our soul. Darkness adds mystery to the soul; it colors the personality. Even sad and depressing events are welcomed because they remind us that life oscillates between joy and sadness; each limits and expands the other. This is the dynamic order of life, what the Egyptians recognized in the rule of Ma’at- the constant rhythms found everywhere in the universe (p. 205-206). Comments, questions, and correlations about possible meanings for an Osiris archetype are not only welcome, but sought. Great, in-depth analysis. The myth of Osiris has had a great influence on me. I would agree with Tarnass that it has an affinity with Pluto energies but at the same time it symbolizes the totality of the psyche in Jungian terms. Thank you for this article because it has brought me closer to understanding my golden Saturn dream. Alchemy has always been very important to me. You really have vast knowledge of the significance of asteroids. I must say I have not explored this topic and I am always happy to discover something new. Thank you. Osiris has also had an influence on me, though I am only at a very early stage of understanding it. You are right that Osiris symbolizes the totality of psyche, which makes it challenging to write about. Also challenging is bring our modern worldview into interpretation of such an ancient deity and time period. Cavalli makes excellent points in his book about this difficulty- including that the Egyptians in this time period had a completely different conception of time than we do. Asteroids are fun to explore because there are so many, involving so many mythic figures. When I had a reading with Demetra George she ran a huge list of asteroids and then integrated the mythic story of the asteroids into my reading. For example, conjunct my Pisces Mercury and MC I have Asclepius, Isis, and Demeter in Pisces, and opposite at my IC is Persephone in Virgo. She weaved these myths together to indicate I could be a healer in soul retrieval, dream work, …etc.. it was very fascinating. Using asteroids, it seems you basically just draw on the mythic meaning, and then look for correlations in your life as far as where the asteroid is in your natal chart and what is happening with it in transit. With Osiris, he is in Aquarius in my 9th house conjunct Mars, Vesta, and Hermes (also Amor and others- but there can be so many you need to limit what you think about!). This recent conjunction of Isis and Osiris at 11 degrees Aquarius was exactly conjunct my Aquarius Mars in my 9th House. I am just beginning to think about all of this, but he seems to symbolize an alchemical process of belief systems at the root of my being, and these signs all certainly indicate why I would be so fascinated with astrology and archetypes. The only asteroid I have explored a bit is Ceres, which is on my MC and I am not even a mother. Obviously Chiron is very significant. I will look at the others, thanks for the hints. Ceres has a lot of other meanings besides being a mother, such as how you nurture others, your own nurturing needs, productivity, and the deep soul work embedded in the myth around the loss of her beloved daughter, the esoteric teachings around creation, death, and rebirth . . . Demetra George is an excellent source and I recommend the book “Asteroid Goddesses” to start with; it is a classic and also has a lot of information on Juno, Pallas Athena, and Vesta. What sort of influence has Osiris had for you? Do you know where Osiris is in your birth chart? You can use the asteroid number 1923 to find it . . . Thanks again for your thoughts and presence. Yes, you are right about Ceres. I certainly have a strong maternal instinct, especially towards my students (having also Saturn in Cancer in the 11th house) and I naturally become a protector and nurturer in all group settings. About Osiris, I have read an excellent book about this myth by Gisela Schoeller. I have tried to find it on amazon but I do not think it has been translated into English from German. What a pity, really. She goes step by step and explains all the events in pychological terms, as a soul journey. The myth starts with a deep loss: Osiris is dead. This reminded me of a Pluto transit when we suffer deep loss and we mourn the old. I love the role Isis plays in this myth with her sacrifice and gentleness and devotion and love and the theme of bringing darkness and light together. Sorry for being so cursory but it has been a long day… I think what Schoeller wrote was very Jungian and very similar to what Cavalli wrote (although I have not read his book). The Osiris in my chart is in Pisces conjunct Lilith in the 7th house squaring my Sun in Gemini in the 10th house. (Incidentally, my husband’s Moon is conjunct my Lilith and Osiris. Food for thought.) I have always known that I am not a chatty, small talk type of Gemini. I always wanted to go deep, deep and deeper into everything, to experience death and rebirth like Osiris if you will. Making the darkness conscious is not easy or fluffy but accompanied by great amount of suffering. Maybe this is one of the lessons of Osiris. Thank you for sharing more here. About Ceres, I have a similar dynamic as a teacher- I have Ceres in Aries in my 11th and it is in a t-square with my Cancer Saturn (1st) and Libra Pluto (5th). The Ceres archetype does relate to being a teacher, or really any role in which we are helping to nurture something in others. I also have a very strong caring and protective energy with my students. I didn’t realize you are also a teacher, but that makes sense. Your book reference about Osiris sounds fascinating, and pershaps similar to the book by Cavalli I wrote about here. He also goes through the myth step by step with analysis, as well as placing it in a larger context. He did bring Saturn in like lead in the alchemical process when Seth decides to murder Osiris, but I also agree with you there is resonance between an Osiris archetype and an intense Pluto transit. It is interesting your Osiris is conjunct Lilith in your 7th house. That seems incredibly deep and powerful, and very compelling your husband has his Moon there. I would think you are working on deep core issues in your marriage. I wonder which Lilith you have conjunct Osiris? Lilith can also be portrayed as a fragmented archetype from oppression. Your depth of thought and ability to communicate patterns of symbols in consensus culture could reflect Pisces Osiris-Lilith in your 7th square Gemini Sun in 10th. Gemini Sun in 10th, Capricorn/Saturn house, also makes me think of the Saturn alchemical connection with gold and your dream, and I think would also reflect you being a deep thinker regarding the structure of everything, society and psyche. The Pisces Osiris square coming from the 7th house makes me think relationships would help initiate or stir up important and intense focus on your Gemini soul purpose in the world. I wonder if your husband having his Moon conjunct your Osiris and Lilith in Pisces would reflect a deep process of you becoming more whole through union, on the other hand I imagine it reflects some triggering dynamics that stir things up for you to process. I have been in a deep karmic relationship, and my partner doesn’t have any conjunctions with me involving Osiris, but her Osiris is in Taurus in square to my Osiris and Mars in Aquarius. We have definitely stirred up deep issues for one another. My ex-wife who is the mother of my children has her Venus conjunct my Osiris, and that makes a lot of sense for me at that time in my life: becoming a father helped make me more whole, i was coming from a much more fragmented place at that time. I also think you are right about going into the darkness with Osiris to find the light. I have learned this lesson well. Since I also have strong Gemini energy (Moon, South Node of Moon, Ascendant), maybe being in tune to Osiris helps with making our Gemini minds focused on a deeper place . . .
Just realized the north node of Osiris is conjunct my Sun, and also more widely my Jupiter in my 10th House, and that the south node of Osiris is in Virgo in my 4th House. Just a quick note as an aside. You must have a strong goddess energy or a strong anima as Jung would put it because I was absolutely convinced you were a woman. Makes no difference of course. Thanks for all of your deep and thought-provoking remarks about my chart. Thank you for the compliment. You will find this interesting about Osiris- Carl Jung has his Osiris at 29 degrees Libra conjunct his Jupiter at 24 degrees Libra in his 9th House, opposite his Chiron at 27 degrees Aries and his Neptune at 4 degrees Taurus! Furthermore, his Osiris-Jupiter in 9th is part of a T-Square with his Leo Sun-Vesta in 6th conjunct DSC and his Neptune-Chiron in 2nd. There needs to be another post devoted to this entirely no doubt. Wow that was a fast response- I was just checking back here to make a correction- Jung has Osiris conjunct Jupiter in his 8th house in the Placidus system, not the 9th. However, in the Porphyry house system, his Osiris-Jupiter is indeed in his 9th house, and in this house system, his Chiron-Neptune is in his 3rd House. Such an interesting and intriguing article, Gray. I wonder if you can direct me -or any of us who don’t know where to look- to what chart we might find out Osiris? I found a chart that had my Isis and was recently intrigued to find I had it in two places on the same chart. I had not looked for the second one before. From time immemorial there have been taboos to keep one from discovering this divine inner light, for unless we are ready to receive it we will either misuse this sacred light or destroy ourselves” (p. 101). Scorpio has multiple levels of symbols, the scorpion being the lower, the phoenix and the eagle a Scorpio who has moved on to a higher level of consciousness. One key aspect of Scorpio as part of an individuation process ultimately leading to higher levels of consciousness, can at times be exploring cultural taboos and ultimately finding more of one’s true self by the end of the process. In healing work, confronting and becoming aware of the shadow side can often involve experiencing taboos of a culture or testing taboos in different ways- often leading to a lot of shame and guilt and depression, but in the end an awareness of the shadow that can propel one through a spiral process into higher states of awareness and consciousness. In this way, the location of Osiris in your chart could indicate a place where you go into an underworld journey of shame or depression as a result of testing certain cultural taboos that society conditions us to believe makes us a “bad” person, but that in the end through confronting and facing these deep issues we can ultimately regenerate a truer version of ourselves. This is because the “true gold” of our soul journey has been inside us all along. Such an interesting take on how we mess up!! And how we can reap gold from such occurrences or experiences. Your article is also very intellectual. I wonder, how you might also translate or communicate such a passage in terms of talking about the same material in lay terms with a troubled young person who may need to grasp the possible meaning and beauty of recovering meaning and enlightenment from their seemingly downward turns? If you go to http://www.astro.com and look under the extended chart section for your chart, there is a line at the bottom in which you can enter numbers for asteroids. There is also a link to an alphabetical list of asteroids so you can get the numbers. Osiris is 1923, Isis is 42, and I know you would like to know 399 Persephone and 1108 Demeter. I bet you can find an Icarus asteroid in your chart, too. You have asked an important question. I have been through the experience of needing to grasp the possible beauty of recovering meaning and enlightenment from downward turns, and I have been working on a daily basis with students who have been through this experience or are currently in this experience. All of my students are between the ages of 16 and 21. Many if not most have been through traumatic experiences growing up and with/from their parents or other authority figures. A 16 year old female student earlier in the quarter wrote about having an epiphany waiting for the bus, listening to music, a vivid perception of the vibrant life all around her. This female student had been through intense periods of darkness in her past. Today a 20 year old student who has poetry ambitions read a poem she had written to the class, and it was filled with words honoring the radiant inner beauty of a young woman in spite of many images of negative conditioning. I was struck by how deeply her words struck all the female students in class. Another female student today, during a presentation about herself, pulled out a rock with the eye of Osiris painted on it in order to represent a close friend of hers who had helped her through difficult times. A student who was in my class over a year ago was trying to come off heroin while in my class. She had a brilliant academic mind and dreams of joining the Peace Corp, but she was forced to go into confined treatment at a local hospital by the end of class because of her heroin addiction. I worked on getting her back into class to try again but she became lost. Seven months later or so, she came back to find me in my office. She was now living in California, sober, working in a cafe, and about to begin taking an Existential Philosophy class at a California Community College. She wasn’t even sure why she had chosen to take an Existential Philosophy class. She spoke in Existential Philosophy. She told me that one morning, coming off heroin, she just woke up and looked outside. She said she just woke up. And she rode a bus to a train to California. She stopped doing heroin, took the G.E.D. test and passed it in one attempt. And enrolled again in Community College (I teach a program in Tacoma Community College for kids who have left high school to earn their diploma). Thank you so much for your response,Gray. I had a profound experience in a visualization earlier today. I will write you more about that. It feels a confirmation that if you follow an archetype through its spiral path, that it can and does lead somewhere. The surprise is always startling when it involves new consciousness or an unexpected awareness or way to maneuver that the intellect, in all its dominance and brilliance, has missed, but most of all the Life, again, in that sudden gasp and inhale of new (and needed) air where one has been suffocating in a vacuum. Hi Gray, Now that I’ve had an opportunity to give your post the attention it deserves, I’d like to offer a few comments. First off, this is a wonderful and creative exploration of the Osiris myth, making fascinating connections between the Above and Below that are insightful and useful. In addition to the astrological associations, I was also struck by the theme of “societal oppression,” and how it may relate to the Moses story. There are speculations that Moses was taken in by the court of Akhanaten, the pharaoh who in elevating Aten to the singular godhead, essentially renounced the entire Egyptian pantheon of gods, including Osiris and Isis; all of which added to the rise of monotheism and individualism. In a separate paper, OSIRIS, THE ARAB SPRING AND THE EGYPTIAN REVOLUTION©, published in the Journal of Archetypal Studies, I show the mythic struggle taking place between individual rights and governmental oppression, all of which goes to show that if we don’t learn from mythology, we are doomed to repeat history! Thus, a myth is timeless in its application; just as true with astrology if we know how to interpret the symbols. Astrologically, of course, these interpretations rely on the doctrine of correspondence, a correlation at best and one that doesn’t prove causation, for that we turn to behavior to witness the evidence that these correlations are verifiable. The whole period surrounding this conjunction on March 2nd has for me been a time of inner dwelling, sorting out future direction for my work, the darkness of falling apart before the hopeful resurrection of new insight. Your piece inspired me to think of further correspondences between the Osiris myth and the planetary formation of the earth, something I will research more before offering further comment. One book opens another! For this alone, I thank you for this excellent piece of exploring the mythic correspondences between the stars and earth. I very much look forward to learning more of what you learn and sharing it with us! Hello, thank you for your comment. It is hard to give you an exact meaning without knowing the rest of your chart. However, I think that the story, myth, and archetypal meaning of Osiris will be very significant for you since it is on your Ascendant. Also, since there is a trine to Isis in the 8th House, I think that death, rebirth, resurrection, transformation, all of those types of concepts will be significant for you. When you have difficult experiences in darkness, there could be a healing force of Light brought to you through relationships or self-love in the form of Isis. If you feel at points you have become fragmented, with these aspects there is a promise of a process unfolding in which you eventually become Whole. If I’m doing some astrocartography with Osiris, which means moving on my Osiris-IC-line, would this mean a lot of suffering for me? Actually the idea of moving to there is the idea of escaping from the expected suffering because of Saturn soon making a square on my AC and get instead a trine from Pluto. The relocation would also show asteroid Hermes conjunct MC and asteroid Aphrodite conjunct AC. Sounded to me like the place would be as awesome for me as difficult to find. But now I doubt whether the idea is good…. Now I found that my Osiris is conjunct with the antiscion of my Saturn. Now I’m scared even more. I should look for another place, but I will hardly find something affordable for escaping from the Saturn square. I’m fearing the Saturn square because a Saturn square in my natal teaches me to fear it. So it won’t be done with a short trip or other remedies. Hello, I have to say I have never paid attention to asteroids in Astro-cartography and it is an interesting concept to contemplate. I do not think moving somewhere in connection with your IC is a bad idea. To me, it depends upon what you want. If your IC is activated strongly by a location I would imagine this would be a place to focus on some deep contemplation and self-exploration and perhaps ignite a transformation from within that could take your life on a new trajectory. These themes also go well with Osiris to me. I know that Saturn transits can be difficult and sometimes there can be some harrowing experiences, but personally I do not fear upcoming Saturn transits. I feel in general Saturn demands hard work commitment, and taking things seriously. If there have been events of suffering in your life I am sorry to hear it, and in this case Saturn would be asking you to go into the grief to process it perhaps. However, there are many ways a Saturn transit can impact you depending upon your chart. If you are talking about antiscia, it is also my understanding that they are a form of remediation and tend to make things better by aspect, not worse. There seem to be quite different opinions about Osiris. http://www.daykeeperjournal.com/2012/10/deathly-asteroids/ has a very special, but not encouraging point of view on it. I tried to make a comment there, but it didn’t work for an unknown reason. How big should an orb be for an asteroid? My Moon is not far away from my Osiris and for contemplating and making some changes should the Moon always be good, too. Well, your reply describes Osiris much like some people describe the Moon. Coincidence? Planets seem to be divided into male and female planets in order to describe the different effects, which they have on men or women. Probably also true for asteroids. Saturn seems to be much less mean to women. The effect of male planets (Saturn is a significator for fathers, hence a male planet) can be lived by men in their environment and then women don’t need to do more than watching. I even read from women, who voluntarily visited Saturn lines and seemed to have enjoyed the trip. But I’m male, so I really better avoid them! What I want is a seldomly asked and hence confusing question. My main problem is a lack of money. Because certain houses are dealing with money and income, so it should be possible to solve this problem with a relocation. That’s why I’m searching about and experimenting with relocations. Of course the lack of money makes relocation much more difficult. I can only relocate to a really cheap place and after the next try I will either have success or die from poverty. Strangely, I can’t see the lack of money from my natal chart: Second house begins in Taurus, its ruler Venus is in Seventh and in Libra. Thus in her domicile and strong and also moving direct. Among the main factors there is only a loose trine to my IC and that’s it. Thus my Venus is quite isolated, except when considering asteroids and other minor factors. Relocation to an affordable place will put Saturn into my Second house. Whether I fear him or not, somewhere he has to be. At least I would learn much about the Second house topic. So still better than in the Fourth. I’ve also read about the point of view that Egyptian theme asteroids like Osiris matter only to those, for who Egypt plays a role in their life. In that case all Egyptian theme asteroids should be examined and else it wouldn’t be necessary to look at any of them. Egypt doesn’t play a role in my life. On the other hand, the main planets are all Roman theme and matter always, not only if Rome is important. So I think it is never wrong to involve asteroids.